St. Clair County has over 110 shoreline miles of navigable waterways within the jurisdictional boundaries of the United States. This includes the lower portion of Lake Huron, the St. Clair River with its North, Middle and South Channels and their connecting tributaries (known as the St. Clair River delta/flats region), the eastern portion of Lake St. Clair and the Black, Pine and Belle Rivers. This region of Michigan is known as the busiest marine thoroughfare for pleasurecraft in the world. Michigan has nearly 1 million registered watercraft - more than any other state. Most of these boats are found in southeastern Michigan, which includes St. Clair County. 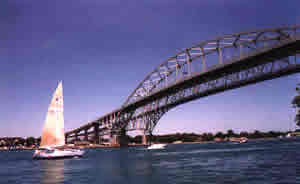 The St. Clair River with its South Channel handles a very high volume of commercial shipping traffic. Any pleasurecraft or commercial freighter traversing between the lower and upper Great Lakes must pass through St. Clair County. Vessels of all sizes from neighboring states, Canada and foreign countries can be found navigating St. Clair County waterways. The Marine Patrol provides services to this area in addition to assisting the marine patrols of adjoining Macomb and Sanilac Counties, the United States Coast Guard and other law enforcement and rescue agencies of the United States and our neighbors in Canada.